I recently developed a new app. (LTI) for physical system modeling from a set of coefficients. I'm already working on some variants with embedded system design tools and have in mind porting it to FPGA. Any suggestions regarding the FPGA implementation? What about a state space model? from line 367 on and compiled. cha_dsp_par, chb_dsp_par can be used to pass the system parameters ABCD. In SS you can even extend the app. to a 2x2 MIMO by using both inputs and outputs. I think with SS is more convenient to pass the matrixes through files. @bingoiceono: On my Redpitaya it works fine even with your filter settings. The signals have equal amplitudes. 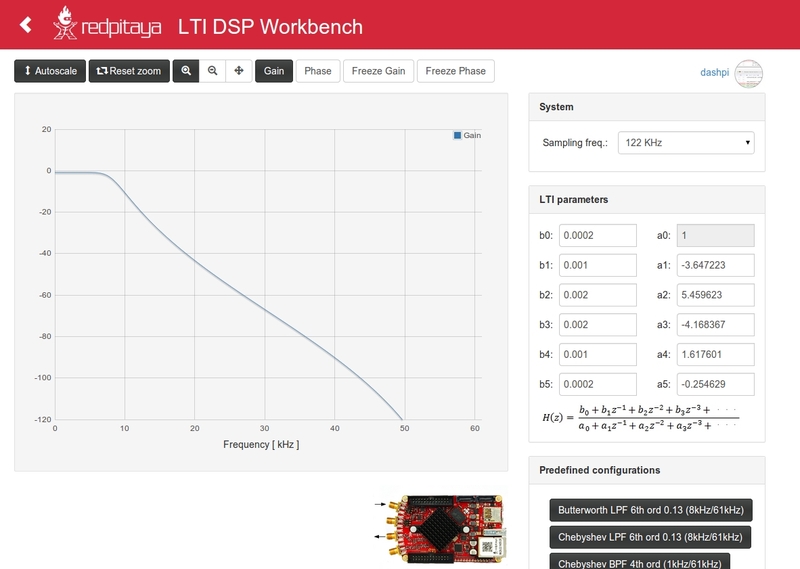 I'm using one of the Redpitaya outputs to generate the input signal + "generate" command. How are you feeding your Redpitaya input? I use an external signal generator and oscilloscope to test it. Signal generator outputs signal to the RP's input port and the oscilloscope. The programmed RP signal is also connected to the same oscilloscope. bingoiceono, have you checked impedance settings of oscilloscope inputs and signal generator (50 ohm / HIZ)? Sometimes wrong impedance selection may produce voltage drops.